Food Archives - Notes from D.J. I’m on the autistic spectrum. As a child, I was hopeless in social situations, always saying the wrong thing and unable to read body language. I also grew up on Tang, Frosted Flakes, Milky Way bars, and Kool-Aid. In my late twenties, I cut sugar out of my diet because I found that when I ate sugar, I couldn’t talk. It was like my brain locked up and wouldn’t process input. Recently, I ate a muffin that had a reduced amount of sugar in it. Within minutes, I began stuttering and floundering for words. This was during a discussion in a seminary class, so the timing was poor. Is there a link between autism symptoms and sugar intake? A 2015 study suggests there is, and anecdotal stories from parents of autistic children abound. Other parents of ASD kids say their kids aren’t affected–and maybe they aren’t, though often the parents say their kids don’t “get hyperactive” from sugar. My own experience indicates that hyperactivity is not the only visible response. From the outside, I look like I’ve been sedated after I eat sugar. Someone who didn’t know better might think this is a good thing. But inside, I’m churning, trying unsuccessfully to process and respond to the stimulus coming in. It’s miserable. But I do like something sweet now and again. Can you imagine going through life never having another dessert? Sugar-free commercial products are an option, though almost all contain artificial sweeteners, which I try to avoid. And the ones with sugar alcohols (like sorbitol and maltitol)– well, I won’t gross you out by describing the intestinal symptoms they cause me. For home-baking, stevia is an option. It’s a natural plant extract with no sugars and no calories, but it’s a little too sweet and has a weird aftertaste when used alone. Stevia requires just a tiny amount, so it doesn’t bulk up a recipe like sugar does. That doesn’t matter if you’re sweetening fruit, but a cake requires the bulk and consistency of sugar to come out right. Ask me how I know. There is a 1:1 stevia product, which is stevia mixed with maltodextrin so it performs in recipes like sugar. The only store I’ve found in my area that carries it is Walmart. Amazon carries an equivalent, Stevia in the Raw , which is a bit more expensive but delivered to your door. Like stevia itself, I find the 1:1 mix has that weird aftertaste. The other day I was looking at a carrot cake recipe that called for a total of four cups of sugar (including the cream cheese frosting). Even using fructose, that’s a lot of sugar. But it’s easy to cut that in half while still making the recipe work. I use half fructose and half 1:1 stevia. The stevia provides sweetness with no calories or glycemic effect, and the fructose is a slow-absorbing sugar that moderates the flavor of stevia. I see the 50/50 mix as a “best of both worlds” approach. In the frosting, I substituted neufchatel for cream cheese. That’s just a lower-fat version made with milk instead of cream. I did that not because I’m autistic, but because I’m trying to eat healthier. I also added an extra package of cream cheese to the frosting to increase the protein and further cut back on the sugar concentration. I also thought the cake might need more frosting than the recipe called for, as is sometimes the case, but I had frosting left over. Herein lies another helpful hint: A lot of recipes can be modified a little, or sometimes a lot, to reduce the sugar content. For pies, the volume of sweetener can be cut in half and a 50/50 stevia-fructose combination can be used instead. So if your pie calls for 1 cup of sugar, skip the sugar completely and try it with 1/4 cup 1:1 stevia and 1/4 cup fructose instead. Imagine: where a recipe calls for a whole cup of brain-scrambling sugar, you may find it works just as well with 1/4 cup of slow-absorbing fructose bolstered with stevia. If my experience is any indication, your autistic loved will thank you! I love deviled eggs. I often bring them to the monthly church potluck. But peeling them has always been a real pain. The shells stick. The whites get mangled. There had to be a better way. So I did what any post-modern chef would do: GTS. It turns out there are a lot of theories about the best way to peel hard boiled eggs. Everyone insists that theirs is the best. Take, for example, this page offering 5 Egg Hacks. You gotta love that first one, literally blowing the egg out of its shell. There are plenty of ideas for pre-peeling treatment to making peeling easier, too. Here’s my assessment of those. First, older eggs are indeed easier to peel, because the egg tends to shrink away from the membrane. Second, starting the eggs in cold water rather than adding them to boiling water doesn’t make them easier to peel, but it does help prevent cracking. 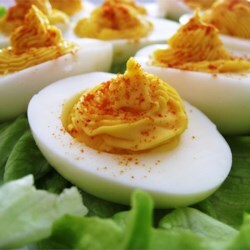 (Try making deviled eggs when the whites have run through the cracks in the shell!) Heating the water to boiling more slowly also seems to help prevent cracking. Adding salt doesn’t make an appreciable difference to peelability. But adding baking soda does. Several sites recommend 1/2 tsp per quart of water, and that made the majority of the 35-egg batch much easier to peel. Now to the peeling methods. I had no luck at all blowing the egg out of its shell. In fact, none of the methods worked quite as described. The best and fastest way I found was to put five eggs in a Tupperware with a little water, put the lid on, and shake vigorously for 5-6 seconds. Don’t overdo it, or the eggs come out with gashes, and may even disintegrate! The result: some of the eggs came out perfectly peeled. Some came out with the shells loose, ready to be peeled off easily. Some didn’t. Of these, using a teaspoon to separate the shell and membrane from the egg worked on some. But on others, the membrane was stubborn, and peeling was a chore. Still, this was a small minority, and a great improvement over the way I’ve done it in the past. Instead of taking two hours to peel 35 eggs, I did it in about 30 minutes. The verdict: there’s no single perfect way to peel an egg. But adding baking soda to the water, using the shake method, and having a teaspoon handy make it a lot easier! I love to cook, but I’m not much on kitchen gadgets. Tomato corer? I use a knife. Egg steamer? What’s that even for? But when it comes to rice, I really love a rice cooker. I had one that went in the microwave, and it worked okay. It was better than cooking it on the stove, where I always seem to either burn it or make it soggy. When the old one died, my wife and I went shopping for a new one. We wanted it to be simple, small enough for a family of four (and easy storage), easy to clean, and cheap. You can easily spend over a hundred bucks on a rice cooker, but that’s not my price range. We settled on the Aroma Housewares 8-cup model. They also have 6-cup and 20-cup models, but 8-cups is about right for us, plus this model offered a steamer basket. We were a little concerned because it claimed to do so much and yet cost so little. We were pleasantly surprised! It does everything it claims. It’s easy to use and easy to clean. And it makes perfect rice, every time. It has settings for white rice and brown rice. I’ve used the brown rice setting on Sri Lankan red rice, also called red samba rice, and it works just fine. It also has a delay timer, so you can set it to start cooking later in the day, perfect for use along with a crock pot, for example, for a dinner prepped before I leave the house. When it comes to kitchen gadgets, it takes a lot to impress me. The Aroma rice cooker is one of the few I’ve gotten excited about.